Really like your perspective on this one. As someone who volunteered to count the offering for something like five years, I’ve often daydreamed about what it would be like if we just had those admittedly awful kiosks for debit/credit cards. (I worked with the cash, and OH, THE ORIGAMI I SAW. It would’ve been impressive if I didn’t have to unfold it to count it.) But you’re totally right: passing the plate is an important part of the “corporate worship” service, and I’d love to see churches actually highlight and celebrate that more. Thanks for the comment! 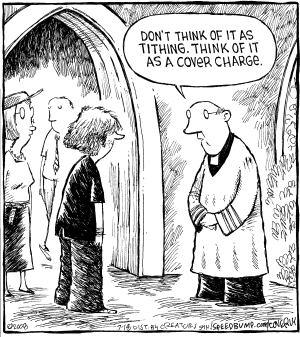 The only thing, inside a church, that needs fixing are the people in it. Traditions boil down to the heart of the people upholding them. An oldie but a goodie. Enjoy!